We usually see the aftermath: the wounded and those tending to them, or the dead and those reacting in shock and grief. Also people running to escape, or broken windows and overturned trash cans, or blood on the ground, or police tape and investigators, or teddy bears and flowers at the makeshift memorials. But we don’t often see the shooting. Tear gas and rubber bullets probably are the most common examples of the shooting that we do see. Their supposedly non-lethal nature guards against press qualms about violating norms of appropriate public content, while the implication that the state is exercising restraint in its use of force always plays well with the regime. But sometimes more than the usual amount of truth gets through the screen. 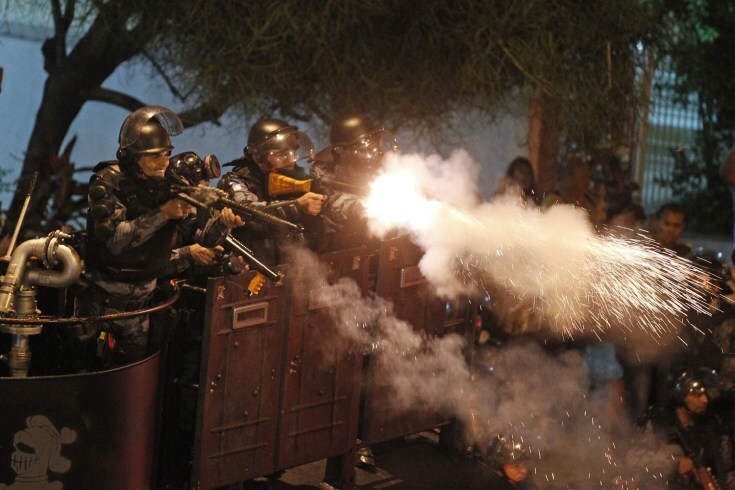 This photo of riot police firing rubber bullets at demonstrators in Rio de Janeiro last week reveals key features of what is standard operating procedure around the globe: The police are having a turkey shoot, they are in no real danger themselves, and they are enjoying their work. Why shouldn’t they? Heavily armed and armored though facing civilians, exempt from criminal prosecution though aiming to harm, finally getting to unload on those privileged scum who would rather whine than work for a living; damn, this is about as good as it gets. Even so, they still are police, and the bullets are rubber, and they are reacting to a civil demonstration rather than a civil war. To see the difference, take a look at this. 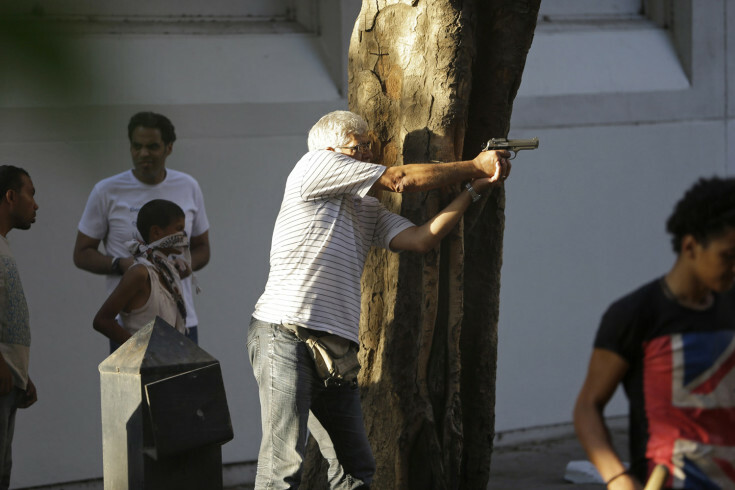 Here we were told only that a man is firing his weapon during clashes between opponents and supporters of Egypt’s ousted President Mohammed Morsi. As with many captions, that is a bit of an understatement. One can fire’s one’s weapon at a firing range, but this guy is aiming, and very likely at another human being. I also have to wonder just what “man” hides, as that looks like a trained firing stance. He looks a bit old for active service, but the training is still there. And like the goons above, he isn’t firing in self-defense; the tree is being used for support rather than as a barricade, and the children and other bystanders seem to think they are in no danger. If that is so, then there also would be little need for a warning shot. No, this guy probably is a cold-blooded killer. And you don’t often get to see that. But there it is, and there is a lot of it going around–in Egypt, Syria, Somalia, you name it. Worse yet, it seems to have become a part of ordinary life in too many places. Which may be why we are more likely to see it. I’d like to think that something else could happen: that by seeing what it is to aim and fire a gun at another person, we would realize exactly how much humanity itself is under siege. Photographs by Pilar Olivares/Reuters and Hussein Malla/Associated Press. ← Previous PostReady, Aim, Shoot!